How to get to Ngong Ping 360 from Tsim Sha Tsui district? Can you tell me the easiest way to get from Tsim Sha Tsui district where I will be staying to Ngong Ping - I would like to go on skyrail and come back using bus Thank you. Comments for How to get to Ngong Ping 360 from Tsim Sha Tsui district? Have 2 full days in hk plus morning and a bit of the afternoon on the 3rd day before departing hk at 7:30. Was thinking of this as a possible itinerary. We're staying at Hop Inn at Tsim Sha Tsui. 2 adults. any comments or thoughts? is it doable? what other places can u suggest? Hong Kong TRIP Itinerary - Most Effective or Not? AFternoon > ....... i dnt knw what to do from here onwards. I would be very grateful if you can please help me complete my itinerary. P.S: We are not really into museum's, traditional temples and stuff like that. We are really interested in most happ activities to do including shopping. We are also planning 1 day macau tour and if really worthy ( one day shenzen tour too), however shenzen tour can be replaced by a day in Hong Kong. We also want to include mid levels escalator in our itinerary but dont know how to do it and what to connect before and after mid levels escalator ride. again, your help would be really appreciated. We have a transit flight to Hong Kong. Arriving 22/June/2014 at 5:00 am and departure 12 midnite. Can you schedule accordingly distance it falls into. Hello, I will be spending a 4 Day 3 Nights trip in Hong Kong this month, and will be staying in Just Inn hotel. I decided to visit Big Buddha, experience Cable Car and Disneyland whole day of Sunday. How to go back to Just Inn hotel? How much is the fare to get to these places? And how much is the fare going back to Just Inn hotel? What is the preferred time to visit these places? Like what time should I leave the hotel? I would greatly appreciate your assistance. Thank you! How to go to The Peak from Ngong Ping Village?? I would like to ask how to go to The Peak from Ngong Ping Village?? How to go to Snoopy World from Tsim Sha Tsui ? Hello,I would like to ask how to go to Snoopy World from Tsim Sha Tsui ? from the airport, we will go directly to ngong ping. where can we leave our baggage? how can we go to kimberley hotel from ngongping? is it necessary to buy roundtrip cable car ticket or single ride? please help us the best route. thank you. we'll arrive at HKG at 7:30AM in the morning, our hostel is at TST. =) is it better if we tour first before checking in our hotel? go to lantau first? Hi, Appreciate your advise if the ffg. itinerary is feasible. Can you advise us the time we should be on the place and up to what time? Jul 21, Check-out hotel then go straight to Ngong Ping 360. Then Noah's Ark. 1. I arrive in Macau 2130hrs and plan to take the ferry to HK. I will stay in Mongkok. What ferry do I take (from Macau)? How far is the ferry terminal from Macau Airport? 2. Is going to Lamma Island in June(do the hiking trail, seafood restaurants) worth the trip? How do I get there from Mongkok? 3. How do I get to 10,000 Buddhas Monastery from Mongkok (via MTR)? I will visit HK on 5-8 Jun 2013. ETA 4:15 pm then directly to Holiday Inn Golden Mile TST. I will be traveling with a 4 yrs old and 7 months baby. What is the most efficient transportation should I use to go the hotel? Day 1 (Wed) starting 6 pm (after check in) what should we do? Any idea? My husband wants to go to the outlet. When is the best time? Day 2 (Thu): HK Disneyland --> Ngong Ping 360 --> HK Shopping or Street Markets. Day 3 (Fri): Ocean Park --> Victoria Peak --> Avenue of Stars, Victoria Harbour and Symphony of Lights. Day 4 (Sat): Any idea for activities before catching our 5:15 pm flight? We plan to go to Ocean Park on the first day, then on the second day to Noah's Ark, then 3rd day move to another hotel (Disneyland Hotel) for the Disneyland tour of course. On the 4th day, since our flight back is still early morning of the 25th, wanted to spent the day exploring Ngong Ping. And there are other attractions that I also want to go like, Avenue of Stars, Victoria Peak, Aberdeen Fishing Village, Tsim Sha Tsui (symphony of lights) and go shopping in the bazaars. Given that can we all go those in our two days and plan it at night? 9am arrival to HKIA booked disneyland hotel for 3nights. Out departure time is 9pm.. Please help me with transportation and restaurants where we can eat. We also plan to have an octopus card.. Yes, I would recommend Ngong Ping first then Disneyland specially if you want to watch the Disney fireworks @ 7:30 pm. HOW ABOUT FROM KOWLOON-NGONG PING 360-DISNEYLAND HOW TO GET TO THOSE 3 SPOTS THANKS. Please help. Been having headaches for the past few weeks in planning a Do-it-yourself itinerary. We are 4 pax going to HK on Nov 15-20, 2012. Watched some youtube videos and i have somewhat familiarized some places and anxiety's going down hehe. However, i still don't know everything especially by looking at the top 10 sights to visit, i cant seem to squeeze in a very doable or realistic plan. Plus we also want to ride the star ferry at night and the century old tram. Thank you very much for helping me in advance in making the itinerary so we could visit the top 10 sights with some shopping and food trips. - where in our itinerary can we squeeze in the ride of star ferry at night from central to TST or vice versa? - where in our itinerary can we squeeze in the ride of century old tram? - how to go to Granville road from Taisan guesthouse TST? - where in our itinerary can we squeeze in night shopping in mongkok with food trips in streets? Here's to read about Casa Hotel getting there travel option instruction. Also, on that page, you can find a location map with some restaurant close to the hotel. Here's an efficient way to get to Ocean Park from Royal View Hong Kong hotel. From the hotel, take the hotel shuttle bus to the Tsuen Wan MTR station --> take the train and get off at Admiralty station (30 mins @ HK$11.8) --> take the bus no. 629 for express ride to Ocean Park entrance (25 mins @ HK$10.6). Follow same travel route in getting back to your hotel in reverse order. hi guys, i will travelling to hk for a holiday, w 2 elderly, one couple and a kid (4 yrs old), and was trying to source for a trip that can suit every one..
can any one advise me where is the best food to find? as i will b staying at casa hotel near to Nathan road..
as this is my first trip to hk.. and hope to have a wonderful one.. Thank you very much for this..i would like to ask how to get to Ocean Park from Royal View? Royal View Hong Kong Hotel is located at 353 Castle Peak Road (ting Kau), Tsuen Wan, Hong Kong. It is uniquely situated in between the Ting Kau and Lido Beaches and facing Tsing Ma Bridge. Note that the hotel has shuttle bus services available between the hotel to Tsuen Wan MTR Station, Tsuen Wan West MTR Station, Tsing Yi Airport Express Station, and Tsim Sha Tsui provided for the convenience of hotel's guests. Here's the most efficient way to travel from Royal View hotel to Ngong Ping 360 in Lantau island. Take the hotel shuttle bus (route B) and get off at Tsing Yi MTR station (note that the bus will proceed to Kowloon area so be sure to get off at the first drop off point) --> get into the Tsing Yi MTR station --> take the Tung Chung Line train all the way to Tung Chung station and take Exit B (16 minutes @ HK$11.9) --> walk to the nearby NP 360 cable car terminal --> take the cable car to Ngong Ping (25 minutes ride @ HK$125 - round trip ticket, recommended). I need help how to get to Nong Ping 360. We are booked to Royal View Hotel on May21-24 and we are planning to go there on the first day. re: How to get to The Peak Tram from Tsim sha tsui? YES, the 3 places you've mentioned is very doable in one day and actually, you can still have spare time at night for other HK attractions. From TST, early morning --> Star Ferry to Central Pier --> walk to nearby Central Exchange Square and take bus to Repulse Bay (pls follow link and scroll down to that page to read travel instruction), until noon --> take same bus to Stanley Market, until 4:30pm --> back to Central Exchange Square --> bus 15C or short taxi drive to the Peak Tram lower terminal --> Tram to the Peak where you can visit Madamme Tussauds, until 7:00pm --> bus 15C back to Central Pier --> Star Ferry to TST --> TST promenade for Avenue of Stars and watch the Symphony of Lights show at 8:00pm --> street market shopping til midnight. How to get to The Peak Tram from Tsim sha tsui? I live at US Hotel - Tsim sha tsui and would like to visit Maddame Tussaud and after that I will go to Repulse Bay and Stanley Market. Is it possible to go 3 places in the same date? Please give me some advises. Thanks! Here's a suggested itinerary to maximize your time during your visit to the above-mentioned attraction places in Hong Kong. Day 1: HK Disneyland whole day with a finale of fireworks show --> shopping at Causeway Bay or shopping at street market. Day 2: Ocean Park whole day --> Star Ferry ride from Central to TST promenade to visit Avenue of Stars and watch the Symphony of Lights at 8:00pm --> shopping at night street market. Answers to your inquiry above can be read in this page. Hi there,me and my two other siblings ( 3adults) will be traveling to HK, we will be staying at Panda Hotel (Tsuen Wan) from 4/18-4/22... my arrival time in hong kong would be 7:40am, however my departure time would be 10:40 am.. Please help me maximize my itinerary that would include the most efficient and cheapest transportation, including the travel time. I am really having a hard time to organize which places to go first and how. Yes, you can always roam around Mong Kok for street market shopping even until midnight. Here's a sample itinerary to maximize your stay in Hong Kong and Macau. I afraid you should need at least full day for your Macau trip as you have to spare some of the time for sea transport by ferry. Day 2: Ocean Park --> Victoria Peak --> Star Ferry trip from Central to TST --> TST promenade for Avenue of Stars and Symphony of Lights show at 8:00pm. Day 3: Macau and Macau Casinos. I need you suggestion on how I plan my travel. I'll be arriving at HKIA at around 9:10 pm and will be staying at Mongkok. Can I visit a place from 10:30 to 12 midnight after arrival? please suggest an itinerary that involves a half-day macau tour. Thank you. It's my first time. Here's a travel instruction in getting to Disneyland from HK Airport (first posts). By taxi, read post dated may 29, 2010. Here's a travel guide in getting to BP International from Disneyland (post dated april 20, 2010). You may buy ferry tickets on the day of your travel to Macau at the Ferry Terminal. More topic discussion about Getting to Macau (post dated oct 19, 2011). You may still go to Ngong Ping 360 before heading to Nan Lian Garden. Re: does my itenerarylook good? any suggestions? Yes, your itinerary is good and very doable. Getting to Ladies' Night Market: Get to the nearest Tsim Sha Tsui MTR station and take the Tsuen Wan Line trains going to Tsuen Wan but get off at Mong Kok station exit D3. Follow directional signs to the market. You may go to M Garden Vegetarian Restaurant near Mong Kok MTR station exit E1 on day2 and Lock Cha Tea Shop near Sheung Wan MTR station exit A2. 1. Go straight to Disneyland from the airport. 1. How much is Taxi from Airport to Disneyland? 2. How much is taxi from Disneyland to BP International? 3. Any other recommended transportation means? 1. Do we need to buy round trip ferry ticket in advance? 2. Where can we take ferry terminal from TST area? and how much per person? 1. How much is taxi from BP International to Nanlian Garden? and Nanlian Garden to The Peak? 2. Can we still go to Golden Buddha? does my itenerarylook good? any suggestions? Day 2: Ngong ping village. The peak.Star Ferry to avenue of stars. Symphony of lights. day 3: Ocean park. causeway bay shopping. Transfer to macao around 9 or 10pm. Check in at Galaxy hotel in macao. Day 4: macao sightseeing and a bit of casino hopping. fly out of Macao around 10pm. I would also like to go to M garden restaurant or Lock cha tea shop to try some vegetarian dim sum. Where ca n how can I fit that in? Any suggestions and tips welcome. Re: How to get to Ngong Ping 360 from Tsim Sha Tsui district? Here's a travel instruction in getting to Ngong Ping 360 from Dorsett Far East Hotel (post dated Aug 23, 2011). hi, will be going to hk this march 20-23 and we already have a tour package but the place to visit are minimal like Victoria peak, Aberdeen fishing village, jewelry factory, movie star avenue, disneyland but i like to visit like symphony of lights and lantau island, our first day is a free day for us to tour the city and i want to use that day to go to lantau, how can we go there if we're coming from Dorsett fareast hotel please give me a detailed itinerary coz I'm with my family. the cost and means of transportation. Travel time from TST to Disneyland is 38 minutes @ HK$16.6. good day people! i've been to hk several times but this will be my 1st time to take the train to disney. may i know the train fare from TST station to disney? thanks in advance! The quickest way in getting to Ngong Ping Village is by MTR Trains. Getting to Ngong Ping from Ocean Park: From Ocean Park get back to MTR Admiralty Station and take the Island Lines toward Sheung Wan and get off at Central Station. Interchange trains to Tung Chung Lines and get off at Tung Chung station (40 minutes @ HK$18.8). what is the quickest way going to ngong ping village from ocean park? Im going to hong kong soon, But dont know how to arrange our scedule. Would you have any suggestion for me? there's few Place we must go The peak , Ocean park, Disneyland and Ngong Ping360. Our flight is on 7hb 4pm from malaysia to hongkong. will reach on hong kong airport at 8pm. We manage to Stay at Mong Kok for 5nights. And 12hb will check out hotel to macau for 1 night stay. Here's my additional shopping tips when you get to Shenzhen. Once you exit from China immigration building, the very next building you'll see is the popular Luohu Commercial City a five stories building that sells a wide range of items, including watches, hand bags, clothes, shoes, audio-visual products, souvenirs, curtains, DVDs, etc and a number of restaurants to dine in. Another popular area which is close to it is the Dongmen or known as "Laojie" (or "Old Street"). It is wider than Luohu Commercial City but has a similar focus on Chinese-made and counterfeit goods. Prices are also much cheaper than Luohu. Here's how to get to Dongmen from Luohu. Get into the Metro train subway station --> take the Luo Bao Line (or Red Line) train and get off at "Laojie" station (3rd station from Luohu station), 5 mins @ RMB2.0 and then take exit A. Shopping tip! Please do bargaining. Example if the prize is RMB100, then start to bargain say at RMB30. One thing for sure, you can get the item below half of the introductory prize. BTW, change some of your HKD to RMB at any money exchange counters that you'll see on your way to exit the immigration building. It is safer in there. Current exchange rate is 1 HKD (Hong Kong Dollars) = 0.81764 CNY (Chinese Yuan Renminbi). Just my two cents advise for your safe trip to Shenzhen! Go visit the famous Street Markets - Ladies' Night Market for shopping. For HK Shopping - Causeway bay. I am going for a 6 day 5 nights trip to HK and I am going for a one day trip to Shenzhen from Tsim Sha Tsui MTR. How do I get to Shenzhen from Tsim Sha Tsui MTR and where are the best shopping places for Teenagers and women? Re: How to go to Ngong Ping 360 from Ocean Park? Please click here to read information about Dorsett Far East Hotel, how to get there, and instruction in getting to the most popular HK attractions from the hotel. Getting to NP 360 from Ocean Park. Take the bus 629 from Ocean Park entrance to Admiralty (25 mins @ HK$10.6) --> get into the Admiralty MTR station --> take the Island Line train and get off at Central station --> walk to the adjacent Hong Kong station --> take the Tung Chung Line train all the way to Tung Chung and take Exit B (38 mins @ HK$18.8). Getting to Ladies' Market from TST thru MTR train is quick and easy! Get into the TST MTR station and take the Tsuen Wan Line then get off at Mong Kok station Exit E2. Train travel time is just 7 mins @ HK$4.6. Walk about 3 to 5 mins to the market. Here's to read suggested itinerary 2 days in hk and 1 day in macau to which I feel very applicable for your trip. Here's a travel instruction in getting to Mirador Mansion from HK airport. Here's a travel guide in getting to Macau from TST (specifically from mirador mansion). How to go to Ngong Ping 360 from Ocean Park? Hello, on our first day to HK we would like to go to Ocean Park, then want to ride cable car at Ngong Ping? How to go there thru MTR. We will stay at Dorsett Far east Hotel. We do really want to maximize our stay here. Thanks! How do i get to ladies night market from TST? wat bus or mtr station I need to ride? Hi! I would like to know the best itinerary and place for our stay, 4 adults 1 child. We are arriving Sunday at 10pm and we would like to go to The Peak, Night Market and Lantau Island (Ngong Ping 360, Giant Buddha, we would like to stay at Tsim Sha Tsui then to Macau by Tuesday Afternoon, Our flight from Macau is on Wed night. Kindly include the ways to go to the places, where to go first to make the most of our limited time. Thank you! Please scroll up to the post dated "Aug 23, 2011" in this thread for location information of Panda Hotel Hong Kong and see the walking route map to the hotel from Tsuen Wan MTR station. The China Hong Kong Ferry Terminal is located at 33 Canton Road, Tsim Sha Tsui, Kowloon, Hong Kong, refer to the ff map. 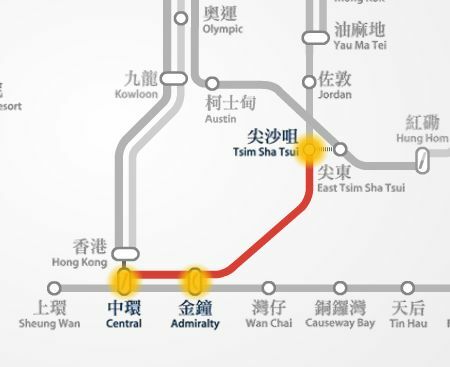 Get into the Tsim Sha Tsui MTR station, about 5 mins walk from the ferry terminal --> take the Tsuen Wan Line trains all the way to Tsuen Wan station and take exit B (26 mins @ HK$8.4) --> upon exit, walk about 7 mins to the hotel. How to get to Panda Hotel? Would anyone kindly tell me how to get to the Panda Hotel in Tsuen Wan from the China Hong Kong Ferry Terminal? Much Thanks. Re: NP36O - spending time? Ngong Ping can be explored in half day or at least 4 hours. A taxi fare from Tung Chung MTR to Yue Kee Restaurant which is located at 9 Main Street, Sham Tseng San Tsuen, Sham Tseng, Hong Kong is about HK$170 at approximately 24 minutes drive (22 km). Hi, can you please advise how long will we spend on np360 and the taxi fare from Tung Chung MTR to Yue Kee Restaurant @ 9 Sham Hong Road, Sham Tseng. I totally agree with Mat, the Peak views are most spectacular at sunset. Get into the Mong Kok MTR station --> take the Tsuen Wan Line train and get of at Tsim Sha Tsui station Exit F (7 minutes @ HK$4.6) --> walk 6 minutes to the TST Star Ferry Pier --> take the Star Ferry to Central (9 minutes @ HK$2.5) --> walk to the nearby Central Ferry Pier Bus terminus --> get into the bus 15C that will bring you to the Peak Tram Lower Terminal (10 minutes @ HK$4.2) --> take the Peak Tram that will bring you up to the Peak (HK$40 - round trip ticket). Take the Peak Tram back to Peak Tram lower terminal --> take a taxi (about 10 minutes @ HK$25) to Admiralty west Bus Terminus (or Admiralty MTR station Exit B) --> get into the bus CTB 629 that will take you straight to Ocean Park entrance (25 minutes @ HK$10.6). Take the Bus CTB 629 back to Admiralty --> get into the Admiralty MTR station --> take the Tsuen Wan Line train and get off at Tsim Sha Tsui station Exit F (5 minutes @ HK$5.1) --> take about 6 minutes walk following directional signs to the Avenue of Stars at TST promenade. It is best time to visit the Peak when the sun goes down until early evening that should be around 4:00pm until 7:00pm. I've been there twice and I'll guarantee it! By MTR: Get into the Mong Kok MTR station --> take the Tsuen Wan Line train and get off at Lai King station --> interchange trains to the Tung Chung Line and get off at Sunny Bay station --> interchange trains to the Disneyland Resort Line to Disneyland station Exit A (32 minutes @ HK$17). By Bus: Take the bus Citybus CTB A21 (going to airport) and get off at Lantau Link Toll Plaza --> interchange bus to the CTB R8 to Disneyland Bus Terminus (59 minutes @ HK$33). Getting to Ocean Park from Mong Kok MTR station then to the Peak and then back to Kowloon travel instruction can be read in this topic discussion (scroll down to the post dated Jun 28, 2011). i would like to know if someone could help me what are routes will i take in the following places in hongkong. Both mtr and bus. i really appreciate if there's someone who could help me. Please note that some getting there instruction that I refer to you below is from Mirador Mansion this is because Chungking Mansions and Mirador Mansion is located just a block away from each other and they have common transportation access point. * HK airport to Giant Buddha (at Ngong Ping). Please scroll up to read detailed instruction. * Getting to Chungking Mansions from Giant Buddha. At Ngong Ping, take the cable car back to Tung Chung NP360 terminal --> walk to the nearby Tung Chung MTR station --> take the Tung Chung Line train and get off at Lai King station --> interchange trains to the Tsuen Wan Line and get off at Tsim sha Tsui station Exit E (38 minutes @ HK$14.1). * Here's a travel route in getting to HK Disneyland and Ocean Park from Chungking Mansions. * Here's a travel guide in getting to Macau. - how to get there? fare? Panda Hotel Hong Kong is a 4-star hotel located at 3 Tsuen Wah Street, Tsuen Wan, Hong Kong. Here's the location map of Panda Hotel Hong Kong and the walking route map to the nearest MTR station. Here's the most efficient way to travel from Panda Hotel Hong Kong to Ngong Ping 360. Take about 7 minutes walk to the Tsuen Wan station thru Exit B3 or B2 (refer to map above). Take the Tsuen Wan Line train and get off at Lai King station. Interchange trains to the Tung Chung Line going towards Tung Chung and get off to that last station, Tung Chung station then take Exit B (29 minutes @ HK$11.9). Follow directional signs to the NP 360 Cable Car Terminal for about 4 minutes walk. Take the cable car to Ngong Ping (25 minutes @ HK$115 for round trip ticket - recommended). I will be in HK on the 28th October for 2 days. We would like to go to Ngong Ping 360 from Panda Hotel. What is the most convenient way to get there? The transport system and the price please. The most efficient way from ICC to Avenue of Stars is to take a taxi, less than 10 minutes drive @ HK$25. It saves you some long walks if taking the MTR trains. Then from Avenue of stars, get into the TST MTR station and take the Tsuen WAn line to Mong Kok station Exit E2 then walk about 4 minutes to the Street Markets - Ladies' Market at Tung Choi st.
Re: Where Is The Best Place To Stay? Most hostels in Hong Kong are pretty much similar in terms of size and room services only, the most important factor is the location. Mirador Mansion and Chungking Mansions buildings are very close to each other but Chungking is much closer to the TST Star Ferry Pier. Both locations are in proximity to the TST MTR station. Meanwhile, the Sincere House (refer to above location map) is also very conveniently located at the heart of Mong Kok, close to the Mong Kok MTR station and shopping tourist attractions like the Ladies' Market and short walking distance to Temple street night market. Re: Itinerary for 6d/5n stay in HK? Ah Shan Hostel Hong Kong is conveniently located at Room 1406, 14/F, Sincere House, 83 Argyle Street, Mongkok, Kowloon, Hong Kong. Just a block away from Mong Kok MTR station Exit D2. Here's the most efficient way to travel from Ah Shan Hostel Hong Kong to Nong Ping 360 then to HK Disneyland. Get in to the Mong Kok MTR station (thru Exit D2) --> Take the Tsuen Wan Line train to Lai King station --> interchange to the Tung Line trains to Tung Chung station Exit B (32 minutes @ HK$14.1) --> walk 4 mins to the NP 360 terminal --> take NP 360 cable car to Ngong Ping (25 mins @ HK$115 round trip ticket) --> explore NP attractions --> take cable car back to Tung Chung and get into the MTR station - take Tung Chung Line train to Sunny Bay station --> interchange to the Disneyland Resort Line train to Disneyland (18 minutes @ HK$11.9). Here's the most efficient way to travel from Ah Shan Hostel Hong Kong to Ocean Park. Get in to the Mong Kok MTR station (thru Exit D2) --> Take the Tsuen Wan Line train to Admiralty station Exit B (10 minutes @ HK$9.9) --> take bus CTB 629 straight to Ocean Park entrance (25 minutes @ HK$10.6). Please help me from International Commerce Centre what is the best way going to avenue of the star. We're planning to go to HK and stay on a budget Hostel. In terms of security, proximity to MTR, comfort, etc, which of the following is the best place to stay? Mirador Mansions, Chungking Mansions, or Sincere House? Itinerary for 6d/5n stay in HK? We're going on a 6D/5N trip to HK and we're staying at Ah Shan Hostel in Sincere House. Can you help me with the following? 1. Reviews of the Hostel we're staying? 2. Tour from Hostel to 360 Cable Car & Disneyland for our 2nd day? 3. Directions to Ocean Park and how much? 4. What else to do on our 4th & 5th day in HK? Re: how to get to International Commerce Centre sky100. The International Commerce Centre (ICC Tower) Sky100 is situated in West Kowloon, Hong Kong accessible thru Kowloon MTR station Exit D2. From Tsim Sha Tsui, get into the TST MTR subway station and take the Tsuen Wan Line train to Central station. Walk to the adjacent Hong Kong station and take the Tung Chung Line train to Kowloon station (19 minutes @ HK$3.8) then take Exit D2. Then take a short walk to the ICC building. Please help me how to get to International Commerce Centre sky100. from my hotel in Tsim Sha Tsui. Re: Directions from Sa Po Road, Kowloon to Ngong Ping to City Gate Outlets then to Airport. To read about detailed information about your hotel location, maps, and getting there instruction, please go to this page. Check out from the hotel --> take a taxi to Prince Edward MTR station, 9 minutes @ HK$25 --> take MTR trains to Tung Chung station (Tsuen Wan Line train going to Tsuen Wan, get off at Lai King station and then interchange trains to the Tung Chung Line going to Tung Chung, 41 minutes @ HK$14.1) --> leave your luggage at Citygate Outlets in Tung Chung --> walk to the nearby Ngong Ping 360 Cable Car Terminal and buy a round trip ticket @ HK$115 for 25 minutes cable car stunning ride (also, you may purchase package tickets like the "Journey of Enlightenment Package" which includes a round trip Ngong Ping Cable Car journey PLUS entry to ?Walking with Buddha? and ?Monkey's Tale Theatre? @ HK$176) --> explore Ngong Ping and the rest of Lantau Island tourist attractions --> take the cable car at Ngong Ping 360 Cable Car Terminal back to Tung Chung Terminal --> Last minute HK Shopping at Citygate Outlets --> get your things and take a taxi to the airport, 10 minutes @ HK$40. * Ngong Ping 360 services will close at 6:00pm so you are suggested to depart Tung Chung at least before 3:00pm to allow more time to experience the attractions. * The Ngong Ping 360 Cable Car was already back in operation since end July, 2011 from maintenance scheduled downtime. * Ngong Ping is a remote part of Lantau Island so that the most direct and efficient way to get there is thru the cable car. Taking a taxi would cost you around HK$200 for about 40 minutes drive, and taking a bus would kill your time as it takes about an hour bus trip to get there which is not recommended in your situation. * Here's to read information about luggage lockers details at Citygate Outlets. Directions from Sa Po Road, Kowloon to Ngong Ping to City Gate Outlets then to Airport. Hi there, will be staying at Regal Oriental, Kowloon. For our last day in HK, we plan to take the cable car ride (1-way) to ngong ping and then do some shopping at Citygate Outlets. Re: Cheapest but complete Tour of Hongkong and Macau (4d3n). Get into the TST MTR station and take the Tsuen Wan Line trains going to Tsuen Wan and get off at Lai King station. Interchange trains to the Tung Chung Line going to Tung Chung and get off at Sunny Bay station. 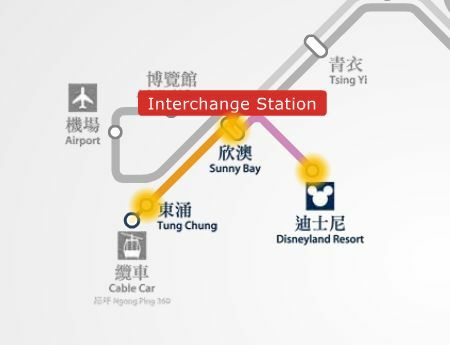 Interchange trains to the Disneyland Resort Line to Disneyland station (38 minutes @ HK$16.6). * Here's a travel instruction in getting to Ocean Park from Yiu Fai Guesthouse. * Get to Victoria Peak (where you can visit Madame Tussauds) from Yiu Fai Guesthouse: Take about 5 minutes walk to the TST Star Ferry Terminal. Get on board to the Star Ferry going to Central, 9 minutes @ HK$2.5. Walk to the nearby Central Ferry Bus Terminus and take the bus 15C a 10 minutes bus trip to the Peak Tram terminal (HK$4.2). Take the Peak Tram up to the Peak, 7 minutes @ HK$40 (return ticket). * Here's a travel route in getting to Macau from Tsim Sha Tsui (you need to scroll down on that page). * Other Hong Kong attractions close to Yiu Fai Guesthouse are the Street Markets (in Jordan, Yau ma Tei, and Mong Kok) and HK Museums located in TST area. * 4 days itinerary in HK and a day in Macau. YIU FAI Guesthouse is conveniently located at 66-70 Nathan Road, Tsim Sha Tsui, Kowloon, Hong Kong. Close to the Tsim Sha Tsui (TST) MTR Station Exit D1. Here's the location map of Yiu Fai Guesthouse and nearby transportation access point. Take Airbus CTB No. A21 from Hong Kong International Airport and get off at Tsim Sha Tsui MTR station (No.13th bus stop from Airport, counting Airport (Ground Transportation Centre) as bus stop no.1). It takes about 64 minutes bus trip @ HK$33. Get into the TST MTR station and take the Tsuen Wan Line trains going to Tsuen Wan and get off at Lai King station. Interchange trains to the Tung Chung Line going to Tung Chung and get off to that last station (total train travel time is 38 minutes @ HK$13.8). Take Exit B and then a short walk to the Ngong Ping 360 cable car terminal or take Exit C to visit HK Shopping - Citygate Outlets. The cable car service at Ngong Ping 360 is still down until end this month. But if you still want to go there, here are your options to get there into Ngong Ping from Tung Chung area. You may take a taxi from Tung Chung straight to Giant Buddha at Ngong Ping for about 35 minutes @ HK$200. Or, you can take the New Lantau Bus (Bus No.23) for about 48 minutes bus trip @ HK$17.2 from Tung Chung Town Centre Bus Terminus (close to Tung Chung MTR station or adjacent to the Citygate Outlets) to Ngong Ping Bus Terminus at Ngong Ping. It takes 37 bus stops to get there. Our flight will arrive at the hkg airport at around 1005am on June 15 and will be staying at YIU FAI guesthouse in Nathan Road TST and will depart on June 18, our flight is 2100pm. We plan to go to Ngong Ping 360; One City Gate Outlet store; disneyland; ocean park; Victoria peak; madame Tussauds; and other nearby places in hkg where we can shop and buy some cheap but quality items that we can take home and lastly we also want to go on day tour to Macau on our last day. Can you also give us the cost of each travel when we go via MTR or bus in each destinations. We also need to know the cost of entrance ticket and how long shall we stay in each destinations. Chungking Mansions location map. Also showing markers at TST MTR station Exit M3 and CTB A21 bus stops. Here's how to get from HK airport to Park Guest House in Kowloon by bus. Take the CityBus CTB A21 from Airport (GTC - Ground Transportation Centre) which is located to your right upon exit from the HKIA arrival hall. Counting GTC as bus stop no.1, get off at bus stop no. 14 (30 Nathan Road before Middle Road). Your hotel is just steps away from that bus stop (refer to above map). Bus travel time is about 64 minutes @ HK$33. Getting from HK airport to Park Guest House in Kowloon by Airport Express + MTR trains. The Tsim Sha Tsui MTR station Exit M3 and M2 is right on the Guest House's doorstep. To read detailed information about travel time, fare, and instruction on how to get there by trains, pls do visit this page. You'll also see a train route map between Airport and TST station. I have additional inquiries, though, if you don't mind. We're particularly staying at Park Guest House in Kowloon. How much travel time is it from the airport to the hotel and from the hotel to Victoria Peak? Is Park Guest House just a walking distance from the subway, bus and train stations? Thanks. Re: We need help to make the best Hong Kong Itinerary plan. Take the Ngong Ping 360 cable car to Ngong Ping village, about 25 minutes of spectacular cable car ride @ HK$80 for single trip and HK$115 for round trip. Day 3: All about your 1-day in Macau itinerary travel details. If you have some more question or follow-up inquiries, just hit the "add your comments" button below. Enjoy your Hong Kong and Macau visit and have a safe trip. Actually, Disneyland would be a full day event but to maximized your time in HK, I would suggest you stay from 10:00 am until 3:30 pm at Disneyland then you may proceed right away to the Ngong Ping 360 Cable Car terminal at Tung Chung then take the cable car to Ngong Ping village. Tsim Sha Tsui (assuming that you're staying somewhere at TST) to Disneyland route: The most efficient way to travel is by taking the MTR trains. Here's the MTR route map between Tsim Sha Tsui and Disneyland Resort MTR station. Get into the TST MTR subway station. Take the Tsuen Wan Line trains heading towards Tsuen Wan and get off at Lai King station. Interchange trains to the Tung Chung Line going to Tung Chung and get of at Sunny Bay station. Finally, interchange trains to the Disneyland Resort Line that will bring you straight to Disneyland Resort station. Total train travel time is 38 minutes @ HK$16.6. Disneyland to Ngong Ping 360 (Cable Car Terminal at Tung Chung) route: The most efficient way to travel is by taking the MTR trains. 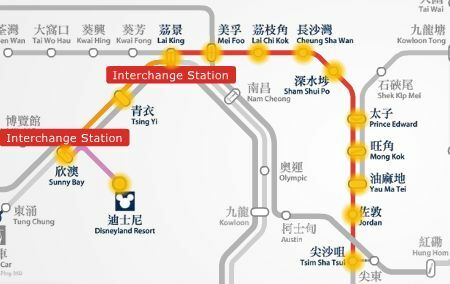 Here's the MTR route map between Disneyland Resort and Tung Chung MTR station. Upon exit at Tung Chung MTR station, walk about 3 minutes to the Ngong Ping 360 Cable Car (Tung Chung terminal). Here's a map at Tung Chung area showing markers like MTR exit and Cable car terminal. Day 1: HK Airport --> Victoria Peak --> Avenue of Stars --> Victoria Harbour and Symphony of lights --> TST hostel, (read this topic for our recommendation). It depends on where you stay at TST, it could be only a walking distance from the Tsim Sha Tsui Ferry Terminal otherwise you can take a short taxi ride to your hostel. Also, I suggest to take a walk from the TST pier to the adjacent Avenue of Stars and wait for the Symphony of Light show that starts at 7:30 pm before heading to you hostel or, you can check in to your hostel first then come back at the TST promenade. We arrive at Hong Kong on June 4 at 9:10 pm and depart on June 6 at 9:40 pm. So technically, we only have two days of trip and we want to make the most out of it. We plan to go directly from the Hong Kong International Airport to the Victoria Peak, Avenue of Stars and other attractions that are open in the evening. Is that possible? How do we get to the Victoria Peak the cheapest and fastest way? After that, we are going to check in at our hostel at Tsim Sha Tsui. How do we get there? How long would it take? On the second day, we plan to go to Hong Kong Disneyland, Ngong Ping 360, and Symphony of Lights. How do we go there from the Hotel to Disneyland to Ngong Ping to Victoria Harbour and back to the hotel? How can we spend our time wisely? On the 3rd day, we plan to go to Macau. How long will the trip to go there be? What transportation would we take from Tsim Sha Tsui to the ferry? What ferry would we take? How much time is it advisable to stay there? Then, we'll go back to Hong Kong for some last minute shopping and proceed to the airport about 7:40 pm. What time should we leave Macau for the ferry? What shopping malls can you recommend that is near to the airport? Thank you very much. We would really appreciate the time schedules you could allot us, directions, and the means of transportation we need to take. Thank you. Re: How about getting to Hong Kong Disneyland from Ngong Ping 360, Giant Buddha? Here's how to get to Disneyland from Ngong Ping. Take the cable car from Ngong Ping Cable Car Terminal adjacent to the Tian Tan Buddha Statue to Tung Chung Cable Car Terminal (opposite side). Close to the cable car terminal is the Tung Chung MTR station. 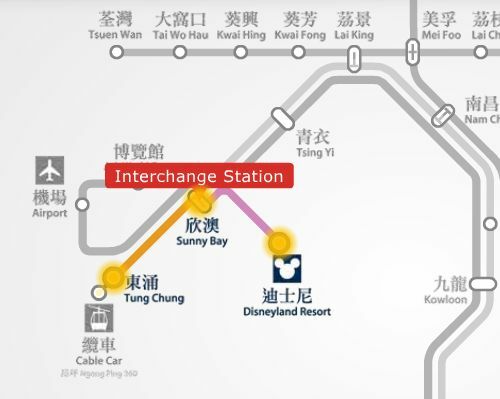 Take the MTR trains and get off at Sunny Bay station (next station) then interchange trains to Disneyland Resort line (18 minutes train travel / HK$11.3). Get into the Tsim Sha Tsui MTR Station, take the Tsuen Wan Line trains towards Tsuen Wan and get off at Lai King Station. Interchange trains to the Tung Chung Line heading towards Tung Chung and get off to that last station and take Exit B (38 minutes @ HK$14.1). Walk about 4 minutes to the NP 360 Cable Car terminal and then take the cable car to Ngong Ping for 25 minutes @ HK$115 for round trip ticket (recommended). You can opt to take the New Lantau Bus Company (1973) Limited Bus No. 23 or 23S for about 50 minutes bus travel time @ HK$17.20 on weekdays, and HK$27 on Sundays and Public Holidays. Half fare for child below 12 yrs old and senior above 65 yrs old.